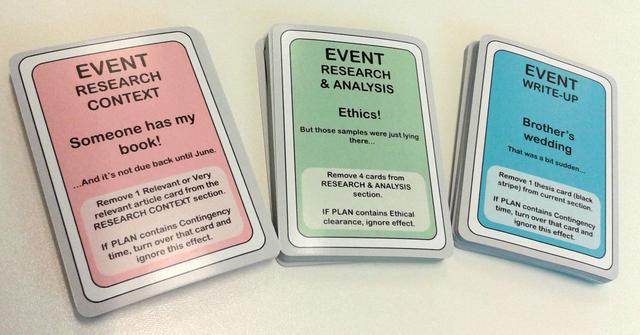 This work in progress game was created to deliver knowledge and understanding of research processes and techniques, within the context of a postgraduate training programme at Glasgow School of Art. Development was in relation to the concepts of encouraging creativity and risk-taking within a safe game environment, and of learning by (potentially) failing. Game characteristics and intended learning outcomes were defined, leading to game mechanics and text that emphasise player agency, working within a time limit, and humour. Initial small-scale evaluation shows that the game is highly successful at delivering the intended learning outcomes and is a memorable and enjoyable complement to the existing course curriculum.